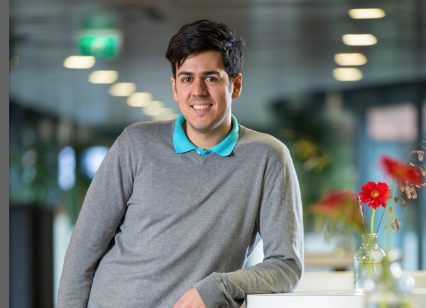 Costa Rican Javier Arias came to the Netherlands to study four years ago after winning a scholarship to Nyenrode Business Universiteit where he now works. He lives in Utrecht, cycles every day and has learned to wear brown shoes with a blue suit. I would define myself as a ‘glocal’. I acknowledge and celebrate my cultural background but I also aim to understand and embrace the roots of the Dutch culture. From my perspective, it makes sense to integrate as much as possible into the country and culture that you choose to live in. I want to learn from and contribute to this society. The only possible way is to understand how it works and how people think. I now live in the Netherlands and I happen to have been born and raised in Costa Rica. In this globalised world, who knows what the future holds! My partner joined me in the Netherlands almost two years ago and we have recently decided to invest in our own apartment. So we are planning to stay as long as possible, although we are open to the idea of relocating at some point if the right opportunity presents itself. However, it would have to be an LGBT friendly country. That is one of the reasons we have chosen to stay in the Netherlands. This is a place where we can be ourselves, enjoy our lives together and grow as a couple with no limitations and prejudice – or very little at least! I am getting there. At the moment, I am somewhere between B1-B2 level. Daring to speak in Dutch is my biggest challenge but it is something I am working on. Winter food! I love erwten soep, poffertjes and oliebollen. Although that usually means putting some pounds on. Desserts. There are many Latin desserts that are not really available in the Netherlands. Whenever I go back, one of my priorities is to find a good ‘tres leches’ and a ‘torta chilena’. Do I cycle everyday? Yes. Do I wear a blue suit with brown shoes? Yes. I have learned to be much more outspoken in social settings than I was before. However, I still prefer to have 2-3 hot meals and I can’t drink milk as part of my lunch. Visit the most popular amusement parks. This is usually a very entertaining experience and it also shows some of the cultural aspects of the Netherlands. And, of course, visit Utrecht! When I first arrived, I couldn’t believe some supermarkets were not open on Sundays or late in the evening. That for me was a given. I have learned to appreciate the work-life balance in the Netherlands compared to that in Costa Rica, although sometimes I do miss the convenience of going shopping after work, finding a pharmacy open in the evening or having home delivery service from the largest fast food chains. There are a couple of places that I would still love to visit, but if I had only 24 hours then I would choose the Northern Islands. I just hope it is not winter.